Free Wi-Fi, Heated Pool, Barbecue, Private Garage and Green Spaces. Property 10: Free Wi-Fi, Heated Pool, Barbecue, Private Garage and Green Spaces. Property 11: Free Wi-Fi, Heated Pool, Barbecue, Private Garage and Green Spaces. Property 16: Free Wi-Fi, Heated Pool, Barbecue, Private Garage and Green Spaces. A Genuine Manor House, a noble and traditional holiday Portuguese farm. 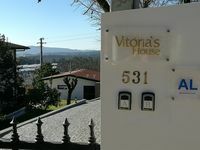 Property 27: A Genuine Manor House, a noble and traditional holiday Portuguese farm. Casa Noble century. XVIII with private pool, balconies and spectacular views! Wonderful Place , Wonderful Owners! Ten of us, mostly Australians, stayed in the house for two weeks in September 2018. The house was amazing - elegant but extremely comfortable. The caretaker was friendly and helpful and generous with supplies of vegetables and wine. We didn't have cars but found it easy enough to get around by train, walking and taxis to explore Porto, Braga and other places. On several days we preferred to stay in the house and enjoy its amenities. Lunch under the tree by the pool was a winner. A marvellous experience.